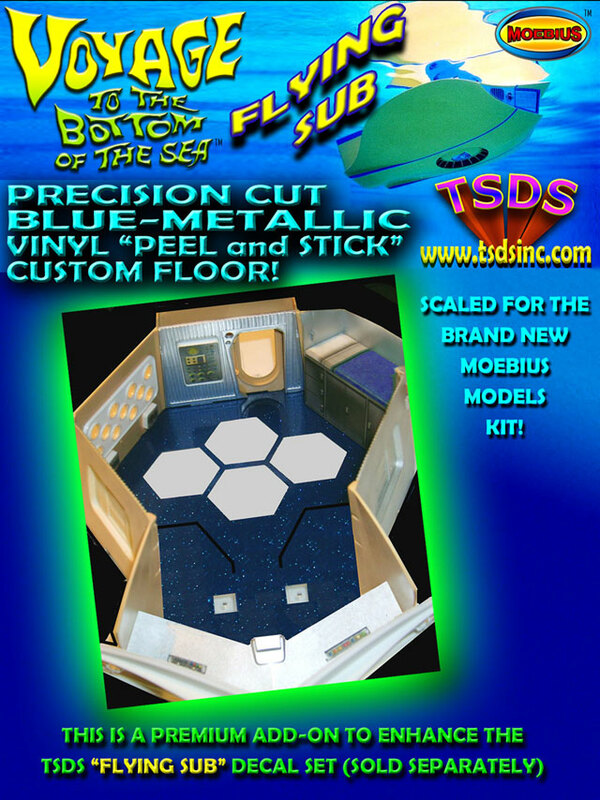 VOYAGE TO THE BOTTOM OF THE SEA - THE FLYING SUB DECALS / FLOOR METALLIC BLUE VINYL FOR THE MOEBIUS MODELS KIT! 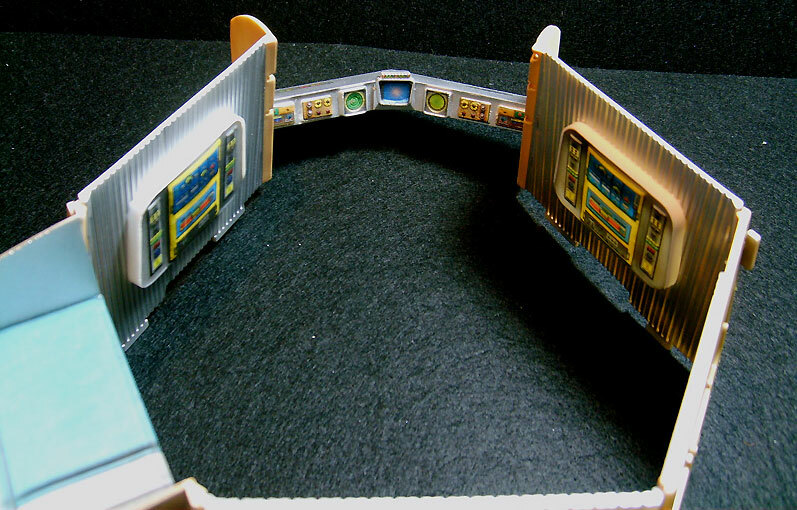 DETAIL YOUR MODEL LIKE A PRO! 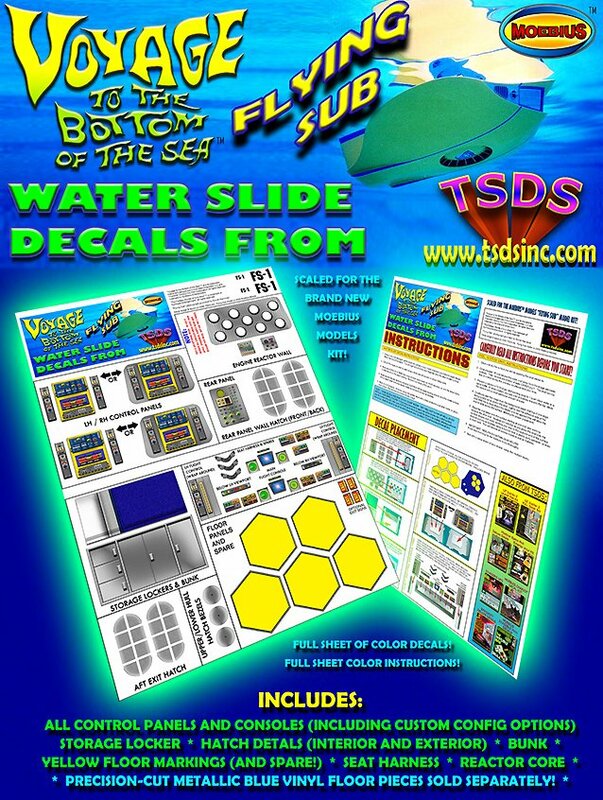 This is a custom designed set of water-slide decals and a deluxe machine-cut METALLIC BLUE peel n' stick VINYL application! For the BIG Moebius Models Model Kit to be released in February! (THESE ITEMS WILL NOT FIT ANY OTHER FLYING SUB OTHER THAN THE MOEBIUS MODELS 14" DIAMETER BRAND NEW KIT!) This Precision Cut METALLIC BLUE Vinyl Upgrade Kit will help you detail your Moebius Models Flying Sub model kit like a professional and have it looking like a studio prop! 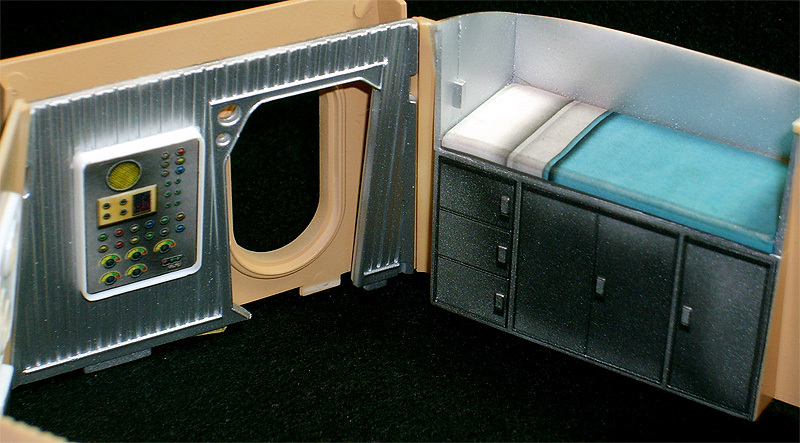 With this, you don't have to mask and paint the orange parts of the exterior of the model! 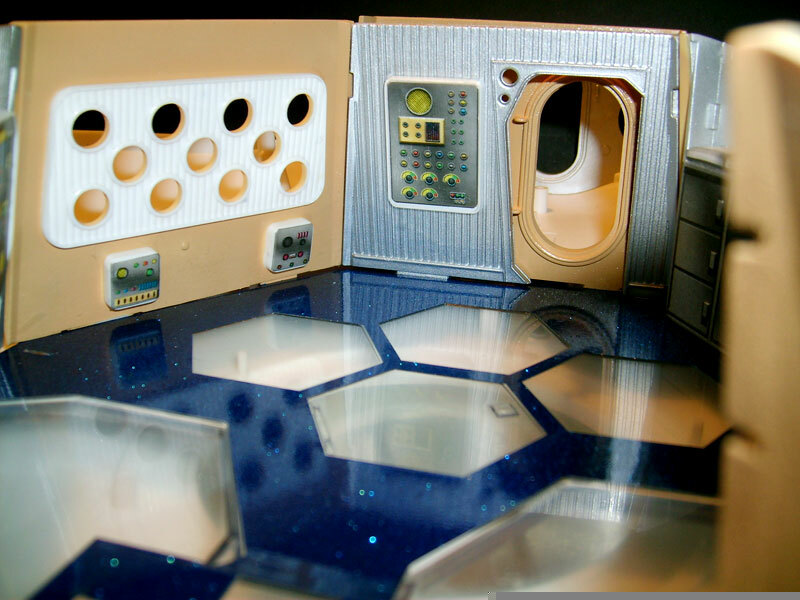 Just peel and stick these applications to the exterior surface! Full COLOR instructions are included! THIS IS NOT AVAILABLE IN LOCAL RETAIL STORES! THIS IS A FULLY LICENSED, COPYRIGHTED PRODUCT! NOTE ABOUT THE DECALS: These are high-resolution, full color detailed graphics - You will be required to sand and file down a bit of surface detail to get them to adhere well to the model, but using either a chisel exacto knife or dremmel tool and some sand paper will do this quickly. I did it in about 5 minutes for the test kit shown in the photos below. 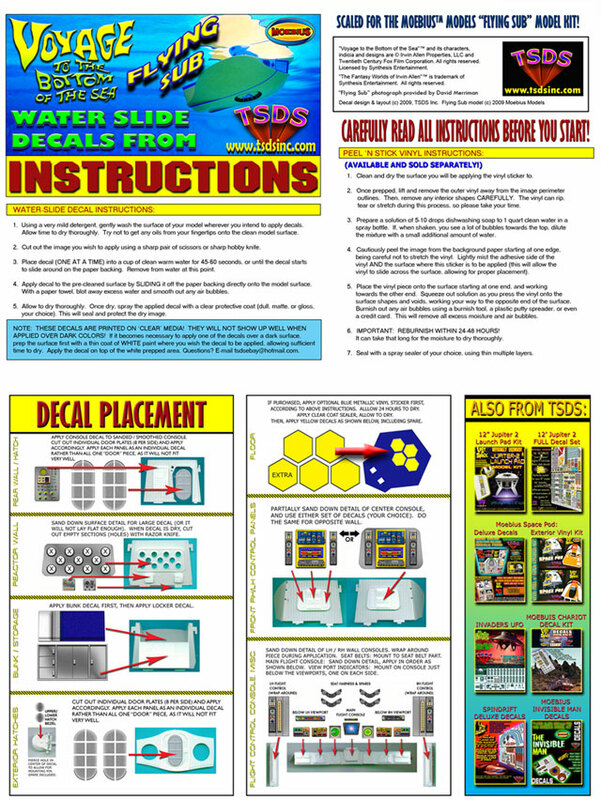 Detailed full color instructions are included with the package. NOTE ABOUT THE FLOOR: This is NOT a cheap, sticker. It is made from the same kind of vinyl used for lettering glass and creating colorful business signs! The blue metallic "metal-flake" texture creates a very realistic looking addition to your model. Designed to put up with punishment from the outdoors elements for years, it should last you a VERY long time on your carefully built and preserved model kit! Forget masking and painting -- this makes that part of the model finishing a dream to complete! And looks GREAT, too! Full instructions as to how to apply this floor piece are included. Follow them carefully -- and make sure you use some kind of clear sealer when you are finished!